Well, it's been 4 years that I've been bitching and moaning on and off here on my own little piece of the internet. I think it's time to move on though. I like the commenting system over at Wordpress a lot more, and Mel's told me I should move there several times. Since it was her nagging that got me to make this blog in the first place, I suppose it's only right that I continue to cow-tow to her. 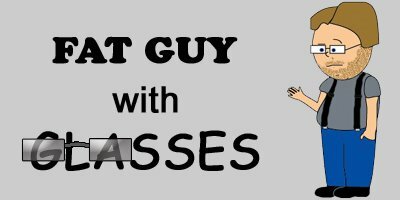 If you're interested, you can find me, and all the crap I've written, over at fatguywithglasses.wordpress.com. If you're not interested, fine. I don't care. I don't need to be popular, or well liked, or accepted by anyone. I'm my own man, and I don't you, or anyone else. Nobody. Just like the rest of the Internet... I enjoy complaining about stuff.